We offer comprehensive eye exams for all ages, from those first pediatric eye exams to senior care evaluations. 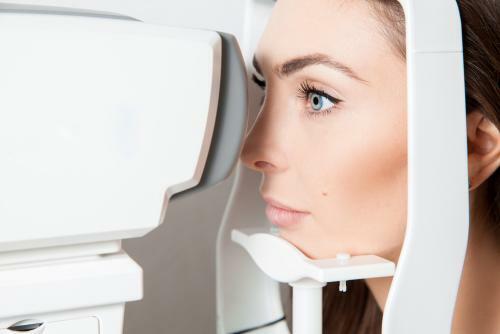 We also provide regular vision testing to see whether you may need some help with common issues such as refractive errors or age-related vision loss. Get your glasses right here! We'll help you select the perfect lenses and designer frames your needs and tastes. We also offer a wide range of designer sunglasses, all of which provide 100 percent protection from harmful UV rays. Ready to swap out those glasses for contact lenses? Your eye doctor at our clinic can administer a contact lens exam to make certain your contacts will be completely right for your specific vision, health, and lifestyle requirements. From single-use disposable soft contacts to extended-use lenses, we have contact lenses to suit your way of life. If you have a "hard-to-fit" condition, we can provide specialized contacts such as toric, multifocal or scleral lenses, as well as rigid gas permeable lenses representing the state of the art in vision correction. Perhaps you'd like to enjoy "no-lens" visual clarity thanks to LASIK, or you're getting a cataract replaced by a crystal-clear artificial lens. we're happy to provide all the pre-operative and post-operative co-management you need to ensure the best results. Ortho-k (orthokeratology) is another exciting way to go through your day without corrective lenses. These contacts "mold" your corneas as you sleep so can enjoy corrected vision while you're awake. Ortho-k lenses can even control myopia progression in your children's eyes. Extensive computer use can cause dry, red, tired, irritated eyes. we can help you overcome computer vision through specialized computer glasses, changes in your work habits, and other safe, effective remedies. Our Larchmont, Westlake, and Los Angeles optometrist can give your family a lifetime of essential primary eye care services. Take advantage today by calling Los Angeles Vision Center at (323) 934-2020 to schedule an initial consultation and eye exam!